The head of the National Audit Office (NAO) has refused to sign off the Ministry of Defence's (MoD) financial accounts for the sixth year in a row. 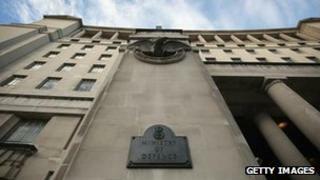 Comptroller and Auditor General Amyas Morse said the MoD had made "welcome progress" on how it tracks spending. But it had failed to provide sufficient evidence to support its valuation of £10bn in military equipment, he said. He added the MoD had failed to obtain the "required approval" for Chief of Defence Materiel Bernard Gray's salary. Rules introduced in May 2010 mean that departments must seek approval from the chief secretary to the Treasury if they want to pay any newly recruited civil servants more than £142,500 - equivalent to the prime minister's salary. But Mr Gray's finalised salary and benefits package had not been approved, Mr Morse noted in his report on the MoD's 2011-12 accounts. He therefore questioned the "regularity" of the payments. "The Ministry of Defence has made welcome progress in improving the way it keeps track of its inventory and capital spares," Mr Morse added. "It is still not able, however, to provide enough evidence to meet the accounting requirements for its valuation of over £10bn worth of military equipment. "It has again not followed proper accounting requirements with regards to leases. Therefore, I am qualifying my audit opinion." Shadow armed forces minister Kevan Jones said the news was "disconcerting for the country". "The defence secretary claims to have balanced the budget, but in the last three days we have had potential cuts to Apache helicopters, over £1bn further cuts and now auditors have refused to sign off accounts," the Labour MP added. In 2010, the NAO said the MoD had failed to account properly for more than £6bn of equipment.